Khasta Kachori / fried APF Dumplings with Spicy Moong Filling ..
Festival times are not complete without savory snacks to go along with the sweet ones. Khasta means “flaky” and this flaky Kachori is a crispy snack that is stuffed with spiced moong fillings & deep fried.Though a little time consuming to make Khasta Kachori is well worth the effort . 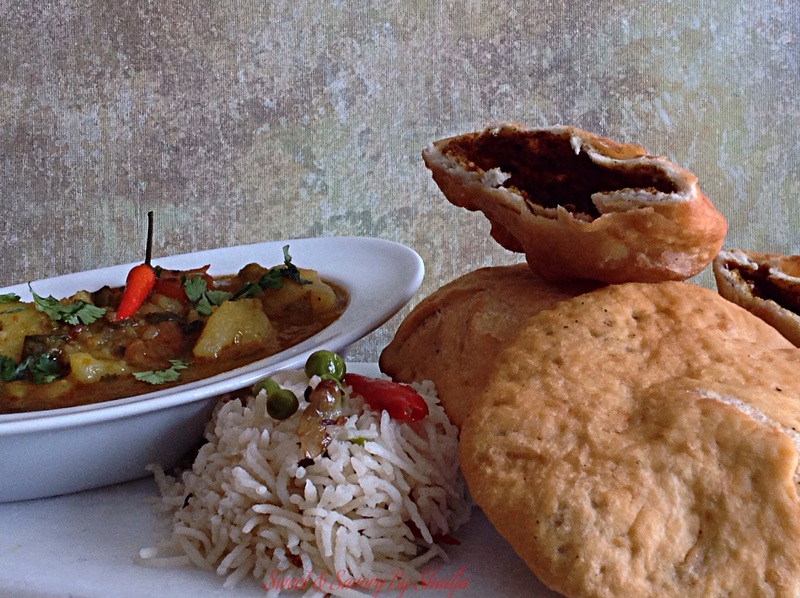 These crispy and delicious kachoris are best served with Aloo Tamater / potato and tomato gravy . For Aloo tamater recipe click HERE …. Mix the flour and salt, Add the oil/ghee and mix till you get bread crumbs like texture. Slowly add water and make a soft dough. Knead well . Cover and keep aside to rest for 30 mins . Wash and Soak dal in water for at least an hour. Once the seeds splutter Add the coarsely grounded daal . Lower the heat and keep stirring until the dal stops sticking to the pan around 5 mins . Cook on medium low heat till the dal turns slightly brown. Add all the spices/ masalas to the daal . Cook daal with masala for few minutes till both gets mixed properly . Preheat oil for deep frying in a frying pan on medium heat. After resting the dough , knead the dough just once more to make it smooth. Divide the dough in lemon size equal parts. Take one part of the dough and flatten the edges and make into 3-inch circle. Leaving center little thicker then edges around. Place 1 teaspoon of filling in the center. Pull the edges of the dough to wrap the dal filling. Repeat with the rest. Let the filled ball rest for 3 to 4 minutes before rolling. Set the kachoris on a flat surface with the seams facing up. Using a rolling pin or the base of your palm, slowly flatten them into about 3 inch circle. 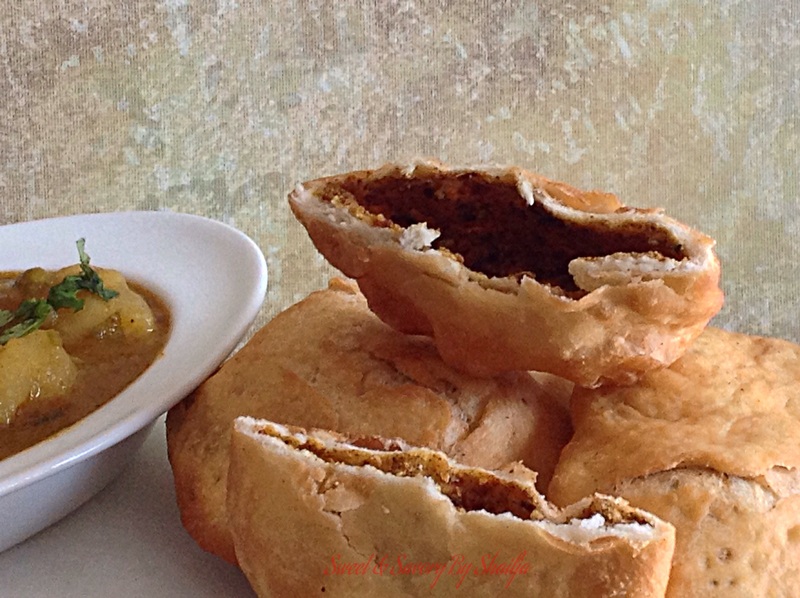 Fry these stuffed moong dal kachori’s on medium-low heat. After they start to puff, slowly turn them over to the other side. Fry until golden-brown on both sides. I like to serve these Khasta Kachoris along with green chutney , tamarind chutney & yogurt . Bringing these to FiestaFriday for Angies birthday celebration …. 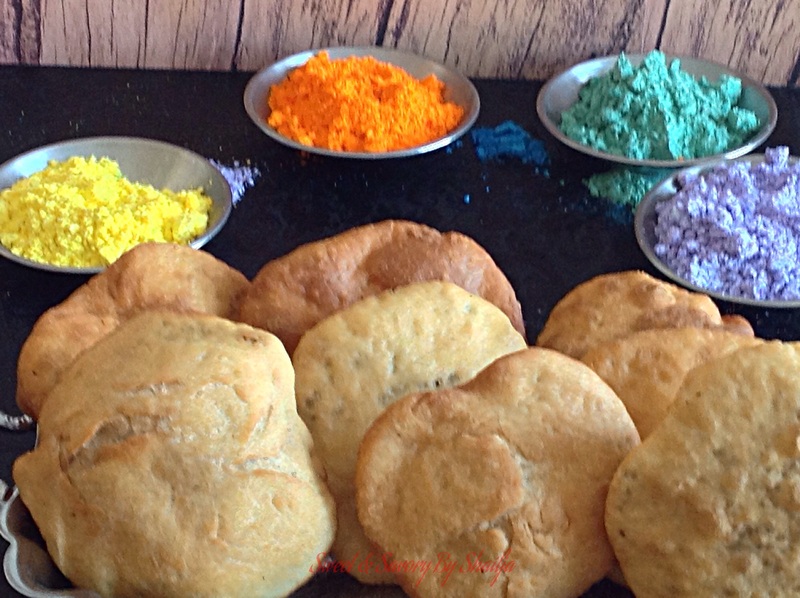 Mathari / Indian Flaky Biscuits…. Mathris are one of all time favorite crispy deep fried Indian crackers. They are one of the most popular snacks in North India & is served with mango, chilli or lemon pickle along with tea. Mix both the flours, salt ,cracked pepper , carom seeds and cumin seeds in a bowl. Add the ghee/ oil and rub between your palms until it takes the form of breadcrumbs. Knead with water and and form a pliable but firm dough . Cover with the damp cloth and set aside for 30 minutes. Divide the dough into small balls and roll them into 3 inch circle. Repeat with the rest. Heat the oil in a kadhai or deep-frying pan on medium heat. Frying pan should have at least 1 inch of oil. Fry the rolled mathris in a batch over moderate heat. Tawa Naan My Way …..
Naan is one of the most popular leavened Indian bread. Today I bring to you An Easy naan recipe which can be prepared at home on tawa , in no time . In a mixing bowl take the maida. Make a well in the centre. Add in the curd, baking soda, baking powder, salt, oil and mix it nicely. Knead a soft and smooth dough using little amounts of warm water. Cover and keep aside in a warm place for 2 hours allowing it to ferment. After 2 hours make 7-8 equal sized balls of the dough. Dust the balls with dry flour. 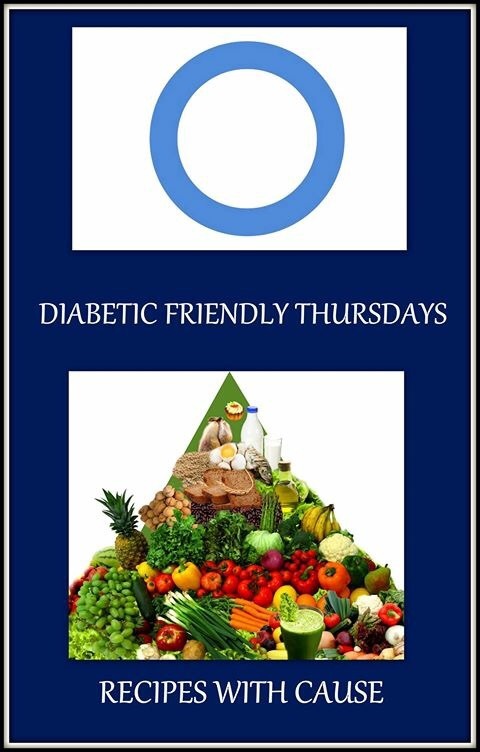 Roll out the ball into a circle of 5-6 inch diameter with the help of rolling pin and flour for dusting. Heat a tawa / griddle till very hot . Apply water nicely on the side of the naan which is to be put downwards. When the bubbles start coming , then is the time to invert the tawa over the gas flame to cook the naan on the other side and to get those beautiful brown spots. Make sure to keep the flames in control as we do not want charred or burnt naan . Use a pair or tongs or a spatula to get the Naan out of the griddle . Sometimes Naan don’t get unstuck by themselves . Apply butter or garlic butter and serve hot . Check her blog at cafegarima . Original recipe by Garima can be found at HERE . Milk- ¾ cup + 2 TBs for brushing the top of the bread before baking . Make sure the water is warm to the touch. If you can’t comfortably hold your finger in the water for several seconds, wait for it to cool. Pour the water into the bowl of a standing mixer or large mixing bowl . Add the honey and sprinkle the yeast over the top. Let this stand for 10 minutes until the yeast has proofed . Add the lemon juice to the milk and keep aside for 5 mins . Melt the butter in the microwave. Stir in the milk , lemon zest and salt. Pour flour and the milk mixture over the yeast . Using the dough hook attachment on a standing mixer, knead the dough for 8-10 minutes. Alternatively, knead the dough by hand against the counter. If the dough is bubble-gum sticky against the sides of the bowl or the counter, add extra flour a tablespoon at a time until it is no longer sticky. The dough is kneaded when it is smooth, feels slightly tacky, forms a ball without sagging, and springs back when poked. Clean out the mixing bowl and film it with a little oil. Form the dough into a ball and turn it in the bowl to coat it with oil. Cover the bowl and let the dough rise in a warm spot until doubled in bulk, about one hour. Grease 1 loaf pan or film them with non-stick cooking spray. Shape dough into a loaf and transfer to the loaf pan. It’s important that the surface of the loaves be stretched taut; this helps them rise and prevents an overly dense interior. Let the loaf rise a second time until they start to dome over the edge of the pan, 30-40 minutes. Heat the oven to 400 F about halfway through the second rise. Brush the top with milk, sprinkle some oats , dried rosemary & grated cheese and bake for 20 – 30 minutes, till the top browns. Finished loaf will be golden-brown and sound hollow when tapped on the bottom. Remove the loaf from the pans and let it cool completely before slicing. Bread loaf can be kept at room temperature for several days. Bread loaf can also be wrapped in foil and plastic, and frozen for up to three months.